Border Harriers AGM agenda for Friday 25th January 2019 can be found Here. Printable version of 2019 Track and Field Fixtures, Here. This years Presentation Night will take place at 7:30pm on Friday 9th November at Carlisle Rugby Club on Warwick Road. Olivia Mason has completed a remarkable few weeks, winning major Under 15 girls cross country titles at Nottingham, Loughborough and Norwich. At Nottingham in the England National Championships on 25th February, Olivia led the 426 strong field home in 15mins 47secs. She was eleven seconds clear of Herne Hill Harriers’ Charlotte Alexander, with regular rival Liverpool Harriers’ Ella McNiven in third. This was Olivia’s second National title having won the Under 13 crown in 2015. On to Loughborough a fortnight later representing Cumbria in the Inter Counties Championships, Olivia finished thirteen seconds ahead of Scotland West’s Lily Haggerty in 15mins 22secs. The County came seventh out of 41 teams. Last Saturday Olivia made it a treble, leading the Cumbria Schools team at the English Schools Championships at Norwich. Olivia was pushed all the way this time in the Intermediate Girls race, but held off the Surrey Schools’ pair of Claudia Jones, and Charlotte Alexander again, by four and six seconds respectively. Younger sister Anna made her mark also in these races. She was 28th in the Under 13 Girls in a field of 467 at Nottingham, 33rd at Loughborough and 56th in the Schools at Norwich. Oliver Dustin from the same training group, while primarily a track specialist, has also run with distinction over the country as an Under 17. 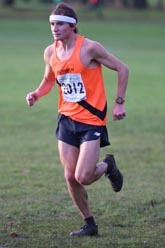 He came home 23rd of 302 in the Nationals, 59th in the Inter Counties and 77th at Norwich. These runs should hold him in good stead for the coming track season. Kieran Reynolds has also gone for strength training in the same age group this season and was a solid 129th in the Nationals, 117th in the Inter Counties and 198th in the Senior Boys’ Schools. James Douglas is always prominent in the Championship races. This year was no exception as he took 48th place in a Senior Men’s massive field of 1,763 at the Nationals in 42:04. Derby AC’s Ben Connor won the title in 39:35. Ross Landon was well up the field in 175th and Liam Medley 647th. 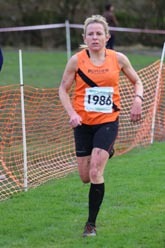 Rhiannon Douglas was again well placed in the Senior Women’s when coming home in 112th place. Melissa McIntosh justified her selection for the county at Loughborough finishing in 83rd position. Clare McKeown capped a great cross country season by winning the British Masters Over 45 title at Wavertree Liverpool last Saturday. She came home fifth overall in the race in 25mins 2secs and had ten seconds in hand in her age group over Jarrow’s Elaine Leslie. A fortnight earlier Clare had completed her Mid Lancs season in style at Leigh winning bronze as third woman over 18, silver for second Over 35 and gold Over 45. It’s been a remarkable comeback for Clare who, after winning the Mid Lancs over 18 title in 2015 against all her younger rivals, missed the whole of last winter with a hip injury. James Douglas narrowly failed to add to his six Senior Men’s titles when runner up over the six race season to Barnoldswick FR’s Thomas Corrigan. Melissa McIntosh in her first season at Under 13 looked in the first match, where she finished tenth, as if she’d have to bide her time, but ran strongly in her next three races to finish fourth overall, just outside the medals. 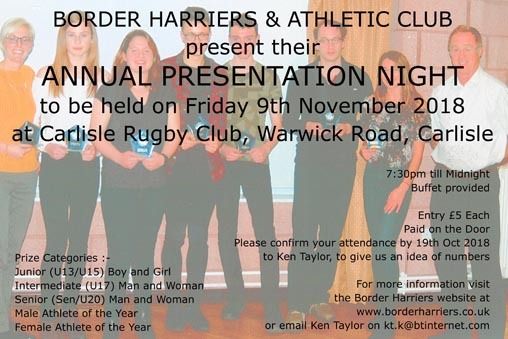 The Border Harriers & Athletic Club AGM will be held at The Sands Centre on Friday 27th January 2017 starting at 7:30pm. All welcome to attend. Good racing conditions on a mild January afternoon in Rickerby Park, Carlisle saw our orange and black vests prominent throughout the meeting. One steep ascent and descent for the younger competitors and two for the Seniors/U20s on the second and third laps made for a more challenging course than seen in the past. Our athletes took four individual titles and four team golds. Tom Farrell, having just returned from warm weather training ‘Down Under’, was on hand to present the medals. The Mason family achieved a remarkable hat trick, with younger brother Sebastian on his debut joining Olivia and Anna on the winners’ podium. James Douglas won his Senior title in fine style after breaking away from silver medallist Keswick AC’s Steve Hebblethwaite and our Mattie Grieve on the second of the three laps. James came home in 31mins 27secs, a lead of 29secs, with Mattie taking bronze in 32:13. Ross Landon was 5th in 33:31 and Liam Medley 12th timed at 38:39. We took the team gold medals, with Keswick AC winning the silvers. Olivia Mason retained her Under 15 girls title most emphatically, opening up a gap of 1min 9secs by the finish; her time 11:55. Nicole Mattinson in 6th 14:27, and Annie Bell in 8th in 15:14 ensured team golds. Skyler Bowes made a welcome return in 13th timed at 16:02. 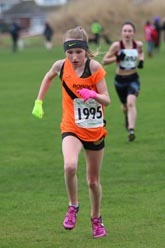 Anna Mason went one better than last year to win the Under 13 title in 10:18. Melissa McIntosh and Melissa Bills were soon back in 6th and 7th places, clocked at 10:47 and 11:09, just two seconds ahead of Millie Bell. Lauren Mattinson in 11:48 and Alex Holmes, 12:09, saw six Border finishers in the twenty four strong field. Team gold medals were inevitable. Sebastian Mason raced home in front in the under 11 Boys race in 6:28. Joey Holmes in 10th and Adam Turley in 16th secured team silver medals. James Dickson was our only under 13 Boy, but raced well in a competitive field for 7th position in 10:34. Hallamshire Harriers’ Lizzie Browne took the Senior Women/Under 20 field apart from the off, winning in a most impressive 23:26. Rhiannon Douglas pursued her throughout to take silver in 25:54. Vets Vanessa Strickland and Teresa Medley were within yards of each other at the finish when 8th and 9th in 29:54 and 30:02 to ensure team silvers. Carolyn Millican, currently setting PBs in every race she runs, was home in 30:47 in 13th place. Silver medals were won. Ashlyn Holliday ran strongly for her bronze medal in the Under 20s, recording 12:09. 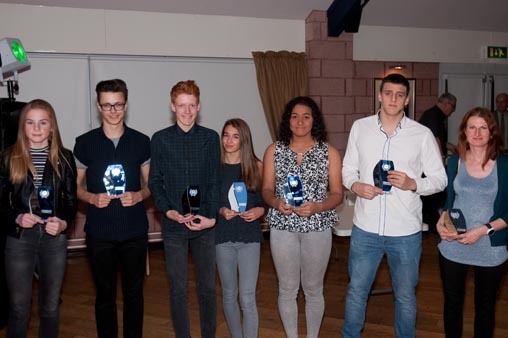 Our Under 17 Men’s team won team golds, while missing out on individual medals. Oliver Dustin was back in 4th place in 21:38, chased home by Kieran Reynolds 21:42. Harry Strickland finished 12th in 22:59 and Scott Evans 16th in 24:20. 70 members and supporters enjoyed the Annual Presentation Evening at Creighton Rugby Club. Entry Forms for the 67th Brampton to Carlisle 10 Mile Road Race on Sunday 18th November 2018 are available now. Here. Results of the Border Harriers August Track and Field Open Meeting on 19th August 2018 in Carlisle are available now. Here.